Glenmorangie has partnered with British sunglasses designer Finlay & Co to create a bespoke pair fashioned out of used whisky casks. Glenmorangie's cask-crafted sunglasses are available for £300 a pair. 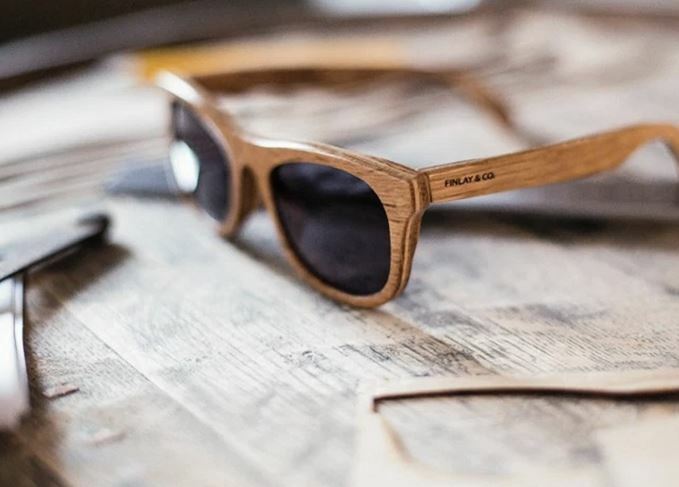 The London-based designer has created a new line of sunglasses from American oak casks twice used to mature Glenmorangie Original. Each pair is designed to demonstrate the cask’s natural wood grain and is individually numbered. Purchasers also have the option to engrave the glasses with a slogan of their choice. Dr Bill Lumsden, director of distilling and whisky creation at Glenmorangie, said: ‘This is a wonderful collaboration between two brands with a deep connection to wood and who share a similar ethos of being unnecessarily well made. To create the sunglasses, Finlay & Co’s craftsmen put each pair through a 16-stage manufacturing process, re-cutting the staves of each cask before stripping them down to thin layers and cross-bonding them against the grain. The effect is a design ‘which mixes strength, lightness and inimitable style’, and one that will join a range worn by the likes of models David Gandy and Cara Delevgine, and and actresses Emma Stone and Jessica Alba. The sunglasses are available to purchase for £300 each from finlayandco.com. The collaboration will be commemorated at the Glenmorangie ‘Beyond the Cask’ pop-up bar in London’s Soho from 3-12 March (excluding Sunday 6 March). The speakeasy-style bar is open to the public from 5-11.30pm, serving a range of wood-inspired cocktails and whiskies from the range, including the recently launched Glenmorangie Milsean and the exclusive Glenmorangie Pride 1978. It will also be the only location in the world where consumers can order Glenmorangie 1963 by the dram. Whisky and fashion collaborations are in season, but are these partnerships more than marketing?